Sushi doesn’t just mean raw fish and rice – it’s a beautifully presented food, full of nutritional goodies, which teaches kids a lot about food preparation and presentation as well as giving them a great deal of fun! The simplest sushi involves vegetables and sticky rice. 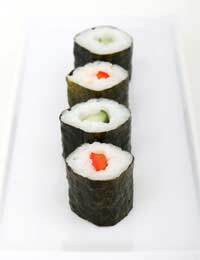 All forms of sushi have different names and the bite-sized morsels of rice rolled around vegetables and wrapped in nori (a form of seaweed) are called maki rolls: they are easy to make and the ingredients can be found in Asian specialist shops, delicatessens and even larger supermarkets. This recipe will teach children how to cook sushi rice and also how to trim and prepare raw vegetables. Rinse the rice thoroughly under cold water by shaking it in a sieve as the water runs through it. Then drain it and place it in a large lidded saucepan with a pint of water – do not add salt. Bring the rice to a boil before allow it to simmer for about 25 minutes – it’s ready when nearly all the water has been absorbed. At this point you should take it from the stove, put the lid on the pan and allow it to stand, covered for around ten minutes. When making sushi you put the various fillings and flavourings in little piles called stations, with your bamboo rolling mats around the outside, and a large bowl of lukewarm water in the middle to keep hands moist while you work. If your children are old enough, you may wish to let them help with preparing the vegetables but as this involves using sharp knives, it’s better if you do this preparation for younger children. Remember to wash all your vegetables in clean water – this is a good time to explain about hand washing and why foods have to be washed to remove not just dirt, but bacteria. Carrots should be sliced into sticks or slices that are so thin you can almost see through them. Length is not important as you can ‘join’ them together to make a line the whole length of the sushi roll. Once cut, carrots need to be steamed for about three minutes over boiling water. Asparagus simply need to have the woody end cut from the stalk and can be steamed along with the carrots for around three minutes. When the time is up, tip the vegetables into cold water to refresh them. Avocado is best if you pick a large one, rather than the baby avocado which are difficult to work with. Slice it in half lengthways and twist the two halves in opposite directions – when separated, pull or slice the stone out of one half and then cut both halves into long strips – you should find it easy to peel away the skin when this is done. Tomato is not a traditional addition to sushi, but has a great flavour if you pick plum tomatoes of average ripeness. Cut off the blossom end, where the fruit tends to be a bit ‘woody’ and then slice in half lengthways. Lay each half flat and slice into thin strips. Spring onion - you can use just the green, which is milder, or add the white too if your children don’t mind something a little ‘hot’. In this case, cut off the base with the roots and any woody or damaged areas at the top and then slice thinly. Cucumber should be peeled, cut in half and then in quarters. At this point you can cut away the seeds and cut each quarter into thin strips, if necessary cutting them shorter to fit into the nori rolls. Red peppers should have the core and white veins removed before being cut into thin strips. Tip the rice onto a large flat tray to help it cool down, and sprinkle it with the sushi vinegar, turning it over and over to mix in the vinegar. Place a sheet of nori on the bamboo mat so that the longest side is parallel to the bamboo, now show everybody how to wet their hands and pick up a handful of the sticky rice which you make into a long mound right across the middle of the nori. Flatten it out so that the whole sheet is covered with a thin layer of rice, remembering to keep dipping your fingers in the water. If using wasabi you make tiny dots of it in a single line on one edge of the rice – remember it is very strong horseradish. Take an asparagus spear and some carrot slices and lay them across the middle of the sheet, then lay your other chosen vegetables on either side of them, making sure they all reach both ends of the sheet. Begin to roll the mat up, using both hands to gently ease the rice mixture over on itself. Roll about a third of the way and then unroll. Roll again and unroll, going two thirds of the way this time. On the final roll, completely roll the entire sheet of nori, easing the mat out of the way so that you are left with a swiss roll of sushi. Turn the roll over so the open edge is at the bottom and then use a long sharp knife to cut the roll into six or eight pieces. To make sure the pieces all match, cut each roll in half, then in half again, and half again. Arrange the sushi on an elegant plate and serve with shallow dishes of soy sauce to dip the sushi into.